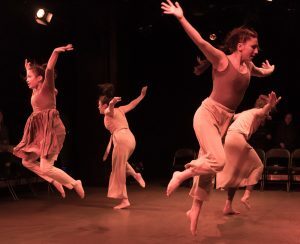 Hailey McCloskey, Jeanette Kotowich, Tin Gamboa and Salome Nieto perform “Gathering Light” at this year’s Vancouver International Dance Festival. Photo: Erik Zennstrom. Four dancers make eye contact with each member of the audience as they walk onstage at the KW Production Studio in Vancouver. The energy of the room seems to change. Everyone here knows they are about to be part of something special. 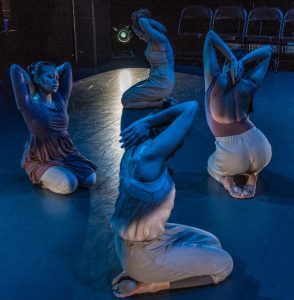 “Gathering Light” is a dance that uses the metaphor of a flower’s struggle to grow in harsh conditions to explore the lives of Indigenous women. “That was the image that held the idea of women’s rites of passage … the small deaths that happen along the way to full bloom,” said Michelle Olsen, the choreographer. The movements are sometimes joyful and light. At other moments, there is tension and discomfort. Audience members are being drawn in by the dance. It’s almost like being asked to bear witness. By the end, there are very few dry eyes in the theatre. Michelle Olsen performing “Frost.” Photo: Juan e Contreras. Olsen is the artistic director of Raven Spirit Dance, a Vancouver-based Indigenous dance company, and a member of the Tr’ondëk Hwëch’in, a Yukon First Nation. She creates contemporary dance pieces that tell stories with an Indigenous worldview. Olsen is part of a growing movement of Indigenous women who are reclaiming and sharing their cultures through dance. The movement is only now becoming more widely accepted by the larger cultural landscape of Canada. This year’s Vancouver International Dance Festival highlighted the works of Indigenous dancers. Six out of the 13 works presented this year were created by Indigenous dancers. In the past week, Margaret and Ken Harris, who founded the Dancers of Damelahamid to preserve North Coast Indigenous dance, were inducted into the Canadian Dance Hall of Fame. Indigenous dancers and companies understand the power of dance in reclaiming culture. Now they are demanding that non-Indigenous audiences pay attention. Looking away is not an option. Jeanette Kotowich performing “Eloise.” Photo: Daniel Paquet. 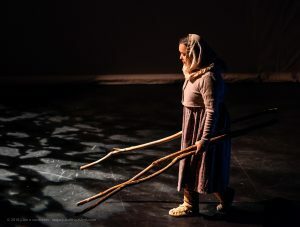 Jeanette Kotowich’s solo performance, “Eloise,” actively engages audiences to ensure that they pay attention to her message as she balances irreverence with ritual, exploring what it truly means to do a land acknowledgement. The electronic powwow music of A Tribe Called Red blasts through the room. Eloise struts toward the stage in a sparkly mini-dress, high heels. She wears a coyote fur around her neck and a raven feather in her hair. As she makes her way through the audience, she draws them in to the ritual that is about to take place, making sure to greet her fans. As the performance progresses, Eloise sheds her layers. The piece becomes more serious and more vulnerable as each layer leaves her body, and her attention shifts to giving thanks. She thanks dance and Louis Riel. She thanks her ancestors, her cousins, and she thanks the land. Jeanette Kotowich performing “Steppin. '” Photo: Daniel Paquet. 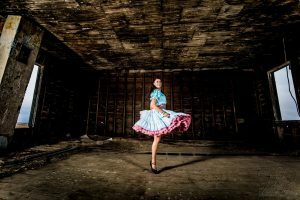 Kotowich, a Vancouver-based Cree Métis dance artist, didn’t begin to learn Indigenous dance styles such as Métis jigging, or how to combine her Indigenous perspective with her contemporary dance training, until her early 20s. 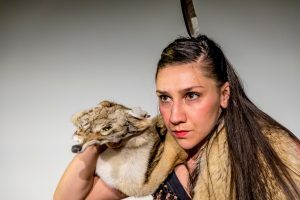 Dancing with other Indigenous-led contemporary groups and creating her own works allows her to explore her connection to her Cree Métis heritage. She tells stories about Indigenous people in her own voice. “What feels good about ‘Eloise’ and about my work is [that I] make space for myself,” she said. Olsen, Chartrand and Kotowich are determined to keep their Indigenous cultures alive. Generations of colonialism and forced assimilation caused disruption in Indigenous communities. 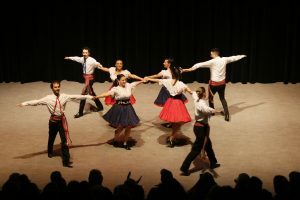 Traditional dances were banned by the federal government for more than five decades. Although many smaller Indigenous communities preserved their heritage and culture, some communities were not so lucky. Indigenous people who grew up in big cities, or separated from their communities, had few opportunities to learn their traditional dances. “Gathering Light.” Photo: Erik Zennstrom. When the Gold Rush came to Dawson City, the home of Olsen’s ancestors, in 1896, the community faced an influx of non-Indigenous people, putting their traditional songs and dances at jeopardy. To safekeep their cultural practices, Elders entrusted the knowledge of the songs and dances to Elders in Mansfield, Alaska. Although it helped save the dances, it also created a void in the community. “I didn’t really have a clear dance tradition to go back to,” said Olsen. V’ni Dansi’s Louis Riel Métis Dancers perform at a Louis Riel Day celebration in Vancouver. Photo: Tim Matheson. It highlights, from the Michif perspective, why dance is such an important tool for reclaiming their culture and heritage. Yvonne Chartrand, in white, performing “Michif Medicines,” a contemporary dance. Photo: Chris Randle. It also inspires Yvonne Chartrand, the artistic director of the Michif/Métis contemporary dance company V’Ni Dansi, to do the work she does. 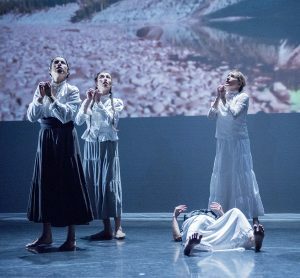 “The first thing that I was compelled to do with Indigenous contemporary dance was tell our Métis stories through our perspective, rather than a colonial historical perspective,” said Chartrand. She first began to dance in the mid-1980s, when she was in her early 20s. It was almost exactly one hundred years after Louis Riel’s prophecy. “That was my own awakening,” said Chartrand.